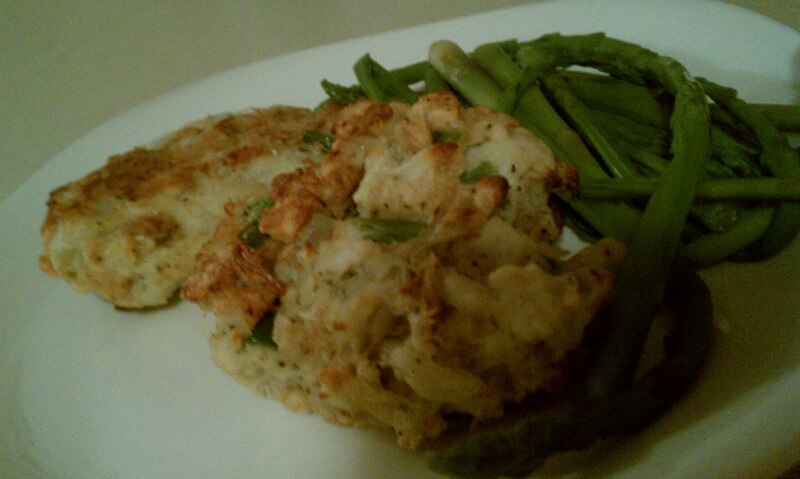 I made these delicious crabcakes from SkinnyTaste's blog. Oh my, this is the stuff dreams are made of. My mouth was literally watering in anticipation. Please refer to her blog for the exact recipe as I'm posting my version of it. Combine onion, pepper, mayo, eggs, crackers, lime juice, and salt and pepper. Mix well and then gently fold in crab meat. Shape into patties using a 1/2 cup measuring cup. Chill in the refrigerator for 1/2 hour before baking. Preheat oven to 400*. Spray a baking pan with PAM before adding crab cakes. Bake 8-10 minutes on each side until browned. Now SkinnyTaste has an excellent recipe for Chipotle Lime Sauce but I through together a homemade Tarter that is definitely not a "skinny" recipe. Stir all ingredients together and place in the refrigerator. This is best when chilled for several hours but it can be used right away.